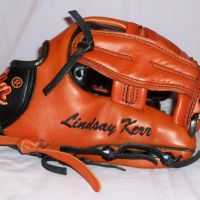 WWW.GLOVE-WORKS.COM BASEBALL GLOVE COLLECTOR FORUM • View topic - 11.75" to 12" for Softball Infield??? 11.75" to 12" for Softball Infield??? Post subject: Re: 11.75" to 12" for Softball Infield??? nothing wrong with reviving an old thread! When I play softball I usually use my PRO200 H-web at SS. People have given me plenty of 'milk' for how small it is, especially if I boot a ball, but its all about what makes you comfortable and confident. My Morton 12TCB also got significant playing time at SS this year...made me feel old, but it worked great. Still only 12". Oh, and nice looking glove by the way. I'm going to have to look into those. Although my 'want list' is 4 gloves deep right now, so it will have to get in line. Only 4!? I swear i add at least 2 everytime i look at this forum! Thank you. They don't have a website, unfortunately. The owner is a former LMB (mexican equivalent of MLB) that works in my league. Good quality overall, very nice leather. I originally ordered it with a brown H-web, but they made it with the blonde one. I am thankful for that, because it looks sweet this way. I only use this glove for softball. I can't stand big gloves for baseball (to me, more than 11.5" is huge). Think a 12" PRO200 or PRO1000 with a basket web would make a good slow pitch IF glove? I'm thinking that since the basket web gives and stretches, it will allow the pocket to deepen a bit for a softball. Also, would a 12" glove like the above eventually form and deepen to the point that it would totally enclose a softball? Never broken in a 12" baseball glove for softball, so not sure what to expect. Have to let one of the SB guys answer the first part of your question, but regarding the second part, it's more a matter of the pattern and web combo than it is about the overall length of the glove that will dictate how deep it gets. For instance, a 12" NP5 I-web will measure a large 12.25", but will still play fairly flat and shallow because of the pattern and web. Conversely, a 12.25" RV23 hinged SP will play nice and deep... two BB IF gloves with similar overall length, but play pretty differently due to differences in the pattern and web. I was referring specifically to a 12" PRO200 or PRO1000 with a basket web, so a relatively deep pattern with a web that becomes deeper at it stretches.